Divine Winnings – What more can you ask for? If you like Ancient mythology and the ancient gods, you’ll love this slot. Filled with minotaurs, medusas and lions, you’ll spin your way to the massive progressive jackpots upwards of several million. Contains two different bonus games. It’s time to take a trip back to ancient Greece where we with the help of different characters and symbols from Ancient Greece spins ourselves to the massive wins that many people can only dream about. 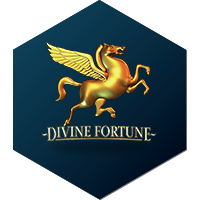 Divine Fortune is a progressive jackpot slot from Net Entertainment. This slot has 5 Wheels with three rows and 20 different pay lines. In this slot, you’ll find a greek theme with mythical creatures such as Minotaurs, Medusas, and Phoenixes. Divine Fortune has four different Bonus functions. The symbols consist of the previously mentioned creatures as well as the classic symbols such as A, K, Q and J. The white horse is a Wild symbol and replaces all other symbols. It’s also the slots most important symbol since it’s used to trigger other functions like Re-spin and the jackpot bonus. There’s also Free Spins you can get by hitting three Scatter symbols in the form of a hand with a lightning bolt. Re-Spin Feature: If you manage to hit a Wild on any of the Wheels it will stick and jump down one step until it finally jumps off the wheel, this can happen to multiple horses at the same time, and you want to keep it going by hitting new horses and coins at the same time, if you manage to catch three coins you’ll move on to the Bonus where the Jackpots are hidden. Jackpot Bonus: In the Jackpot Bonus you get four spins to fill the entire screen with coins. If you manage to fill the first row, you’re guaranteed the Minor bonus, the second row for Major Bonus, and if you fill the screen, you’ll win the Mega Bonus which is the biggest of them all. Whenever you hit a new coin, the Spins are refreshed, and you get new ones. Free Spins: If you manage to hit three Scatter symbols in the form of a hand with a lightning bolt in it you’ll win the Free Spins Feature. In the Feature, you’ll get 5 Free Spins where all the Wild Symbols expands to fill the entire wheels, just like in the main game you’ll also get a Re-Spin with Wilds and the Wilds will jump down one step until they’re off the wheel. The Re-Spin keeps going until no more Wilds are on the wheels so if you’re lucky you can keep going by hitting new Wilds over and over. Divine Fortune is a very exciting slot with a Mythological Greek theme. This slot offers multiple different functions and is just as fun in the main game as it is in the various functions the slot has to offer. The wild is used to trigger many different features, and it can also help you hit nice wins if you’re lucky, even in the base game. This slot has an RTP of 96.59%, and the bet ranges from 0.2 Euro to 100 Euro per spin.